Let the business world know you have the knowledge and skills needed to manage HR challenges in a global marketplace. 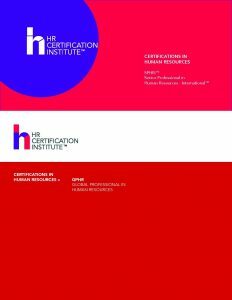 Earn the Global Professional in Human Resources® (GPHR®) from HR Certification Institute® (HRCI®). The GPHR demonstrates your mastery of multinational HR responsibilities, including strategies of globalization development of HR policies and initiatives that support organizational global growth. The development of global HR strategies to support the organization’s short- and long-term goals, objectives, and values. The development, implementation, and evaluation of global staffing strategies to support organizational objectives in a culturally appropriate manner. This includes utilizing the employer brand; performing job and cost analysis; and attracting, recruiting, hiring, and managing global mobility to meet business objectives. The establishment and evaluation of a global compensation and benefits strategy aligned with the business objectives. This includes financial and non-financial rewards. The design, implementation, and evaluation of organizational development programs and processes to effectively develop a global workforce supporting business goals, culture and values. The design, implementation, and evaluation of processes and practices that protect or enhance organizational value. This includes managing risk, ensuring compliance, and balancing employer and employee rights and responsibilities on a global basis.